The campus is composed of 10 unique housing locations, called colleges. Each college was designed to incorporate the natural surroundings and to facilitate student learning.and community. The colleges each have residential space (apartments or residential buildings), dining facilities nearby, and meeting space. College Eight opened its doors to students in 1972. The college is located on the west side of campus, overlooking the city of Santa Cruz and the Monterey Bay Sanctuary. The college theme is Environment and Society. College Eight has eight traditional residential buildings, two in each quad, housing approximately 100 residents per quad. Each quad consists of a three story “L” shaped building with a two story “Garden” building behind each “L” building. The quads share a courtyard with an open grassy area. The housing areas are only a short distance from the Oakes/College Eight Dining Hall. There are laundry facilities in each of the “L” shaped buildings. Double and single bedrooms are available on each building floor. All of the floors have shared bathroom facilities, wall-to-wall carpeting and the windows have shades (drapes in apartments). Each bedroom has wired ethernet and a telephone jack. A bed (twin, extra long), desk, chair, dresser, and a closet is provided for each occupant. Overhead lighting is in all rooms. All apartments at College Eight are furnished. There are single and double bedrooms and each apartment residence have shared living room, kitchen, and bathroom facilities. In the bedrooms, each resident is furnished with a bed, mattress (extra long twin), dresser, and desk. Each bedroom has wired ethernet and a telephone jack. The living room has a couch, love seat, coffee table, and end tables. The eating and dining area has a table and set of chairs. Floor plans of a typical residential building and apartment building are below. To enlarge the image, click on the image to open in a new window or tab. A virtual tour (in Apple QuickTime) of room configurations can be viewed from the UC Santa Cruz campus housing virtual tours page. Photos of a typical residential building bedroom and apartment can be viewed in our UC Santa Cruz photo album. 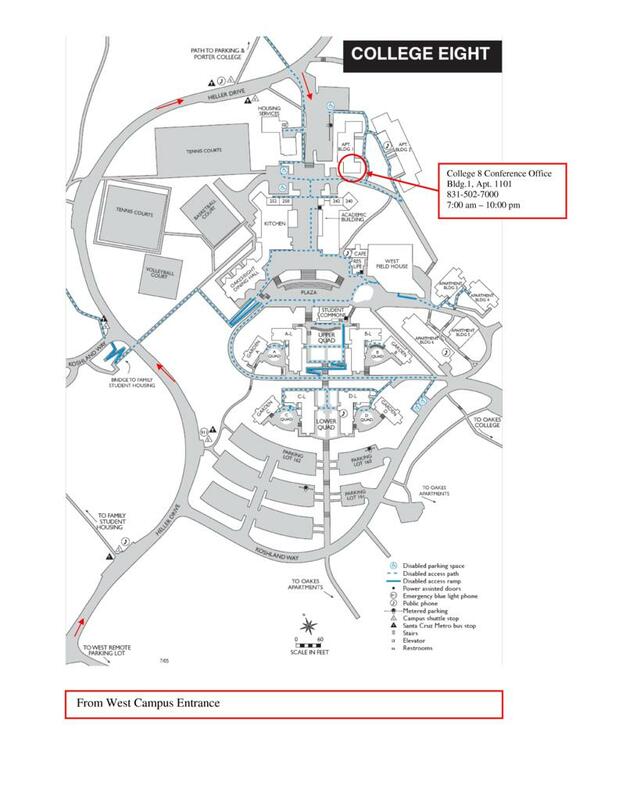 To see the layout of the college buildings download a pdf version of the college map.